This worksheet is used with a beginning anatomy unit that discusses anatomical terminology and body regions. I no longer use a textbook for this course, so many of the handouts can be completed without other resources. If your students use a textbook, you can print page one without the second page which includes the descriptions. 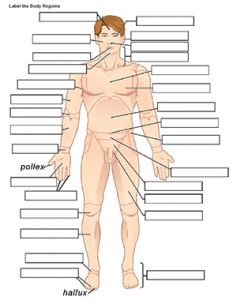 This is a very simple exercise that requires students to read the descriptions of where the body regions are located and then label the image. For example, brachial is the arm, and antebrachial is the forearm. This foundation of terminology can be very helpful in later units where students must learn names of muscles and arteries. Students can also print flashcards and take a practice quiz.